This is a place where I’m hoping to keep a diary of the bees on ‘Bee Alley’ a stretch of footpath I’ve nicknamed because the succession of spring emerging bees seems to present me with a new species each lunchtime when I take a walk out. 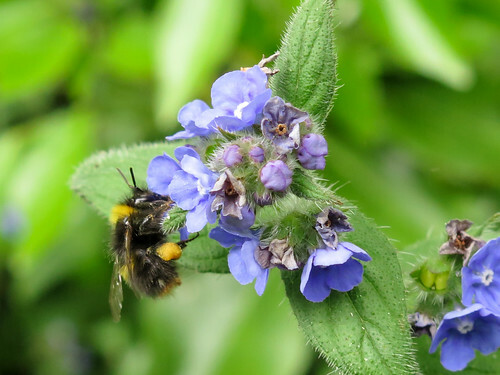 The green alkanet has just begun to flower properly with white dead nettle beginning to emerge. 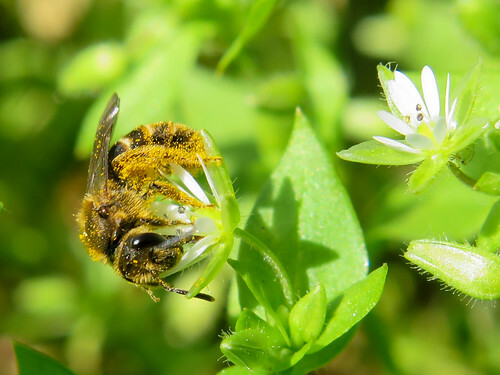 Other species in flower include common chickweed and ivy-leaved speedwell, as well as a stray grape hyacinth which has managed to establish itself. There is a good leaf layer of nettle and cow parsley – neither in flower yet – with the ivy covering the back fence. A few small patches of ground ivy flowering very low to the ground. 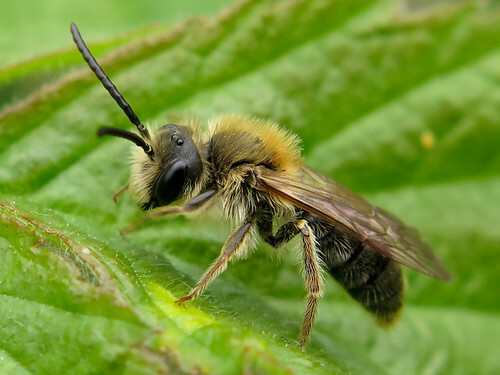 Several male feather-footed flower bees – Anthophora plumipes – patrolling and chasing each other along the vegetation along with the occasional female who was subject to rather unwanted looking attention from one of the males! 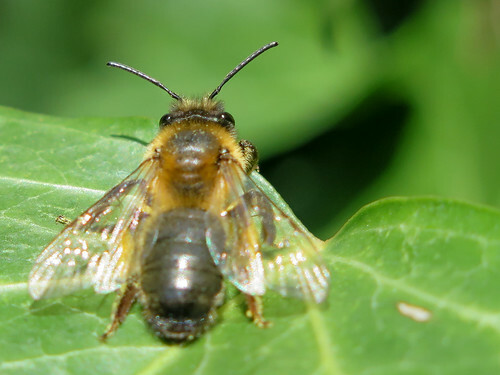 No signs of females today but still plenty of male feather-footed flower bees. 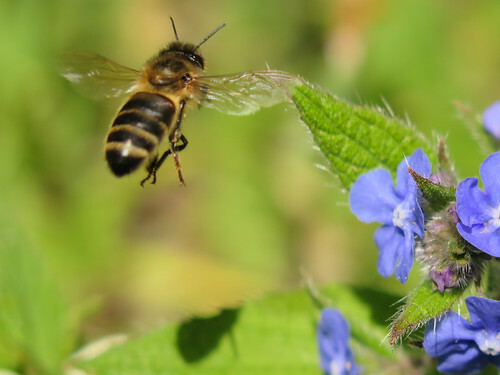 Cloudy and so the bees were slower than their frantic patrolling in the sunshine the previous visit – pausing frequently to rest upon the cow parsley leaves whilst foraging on the green alkanet. Also noted were red-tailed bumblebee (Bombus lapidarius) and buff-tailed bumblebee (Bombus terrestris) queens on the ivy against the back fence which presumably was one of the warmer places to be, despite the lack of sun. 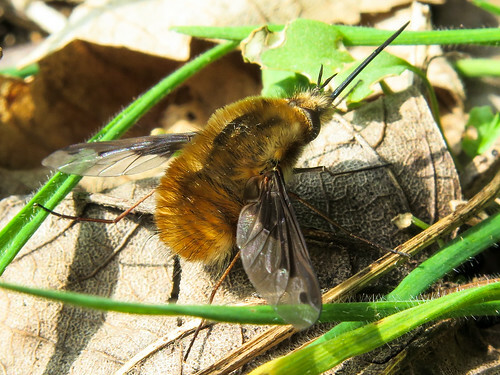 No new bees but the first appearance of the bee flies – Bombylis major. 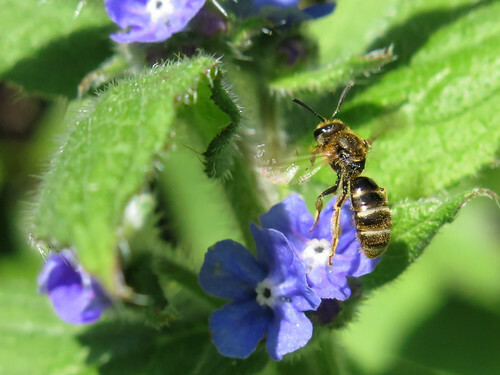 The afternoon was sunny and they were spending short periods foraging on the green alkanet before returning down to sunnier spots on falled leaves as well as the cow parsley foliage to bask. Dandelions appear to have begun their spring flush with a number in flower along the pathway with more growing at the base of the wall beside the adjacent road. 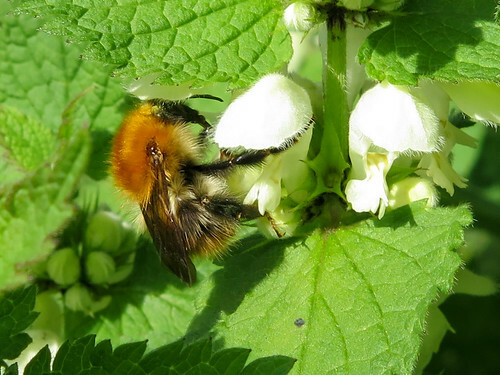 Plenty of carder bumblebees (Bombus pascuorum) foraging on green alkanet and white dead nettle with tree bumblebee (Bombus hypnorum) queens also noted. First sighting of a mining bee – possibly the hawthorn mining bee Andrena crysosceles – basking on the leaves of the alkanet when I first arrived. 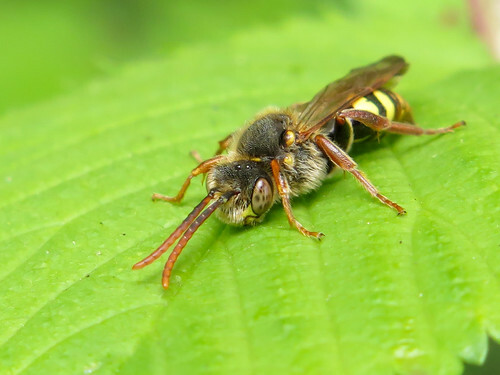 Two species of furrow bee – Lassioglossum sp. 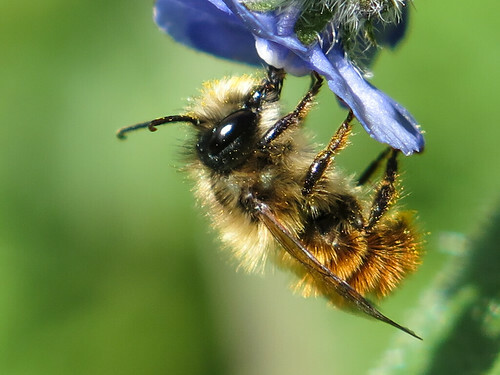 were present – one was larger and primarily foraging on pollen-covered dandelions along with common chickweed. The other Lassioglossum sp. 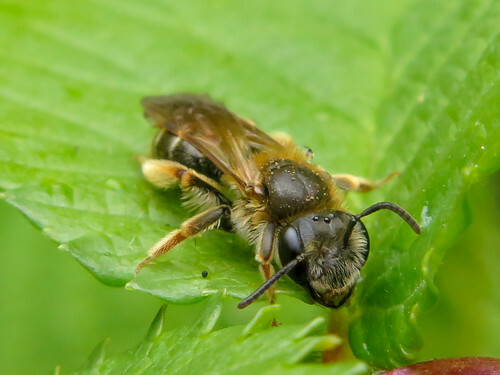 was smaller and one of the ‘four metalic species’ according to Steven Falk’s advice on twitter – difficult to get closer to a species ID without a sample and very hard to get a good clear photograph of such a small bee. 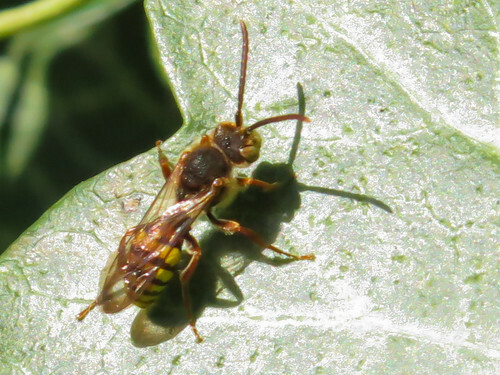 To cap off a busy visit, the first sighting of a nomad bee – Nomada sp. 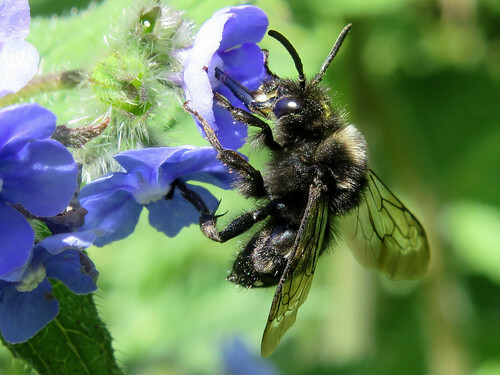 – alongside the solitary bees. Currently working on whether an ID can be hazarded for this beast! 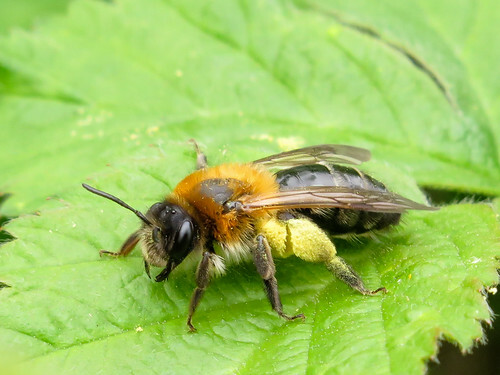 Two new species recorded today – the first was within steps of entering the footpath, this stunning early mining bee – Andrena haemorrhoa. It was resting on the alkanet leaves and flew off shortly afterwards, not to be seen again. 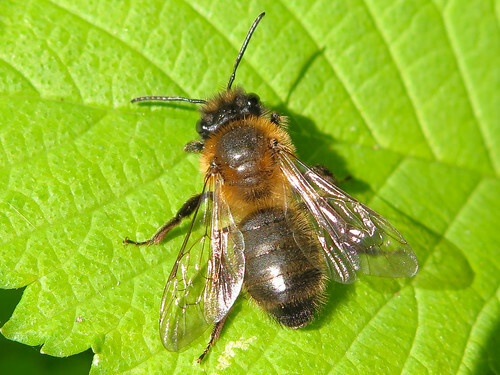 I caught sight of a few tawny mining bees – Andrena fulva – foraging on the blackthorn up near the cemetary and onto the Hills and Hollows, but found one basking in the sunshine on the walk back down through Bee Alley – again leaving before visiting any of the flowers. No new species in flower but the fiddleneck (Amsinckia micrantha) has started to develop the characteristic curl as individual yellow flowers turn into heads, and there are good displays of dandelion, daisy and field speedwell within the cemetary. Close to the fiddleneck is another member of the borage family – wood forget-me-not – in flower now too. Only seen beeflies foraging on this flower to date. 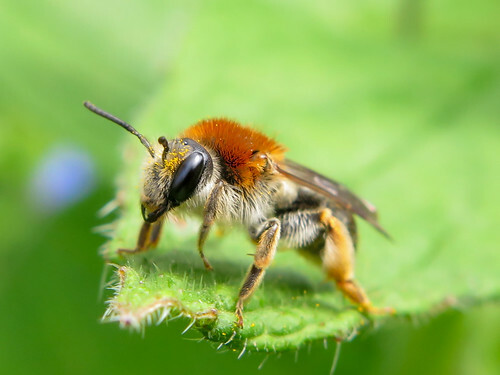 At least 3-4 red mason bees – Osmia bicornis – patrolling and foraging exclusively on the green alkanet flowers, occasionally coming to a rest and basking on the leaves, especially in brief moments when the sun passed behind the clouds. They seemed eager to get into arguments with other pollinators, including bee flies when they encountered them on the wing. Good numbers of carder bumblebees, including smaller workers, foraging on the alkanet and deadnettle. 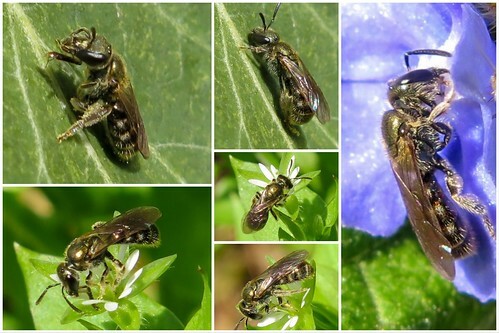 Many feather-footed flower bees still patrolling with 3 males all hovering and attempting to mate with the same female at one point. The bee fly numbers appear to be increasing, with a range of different sized insects on the wing. 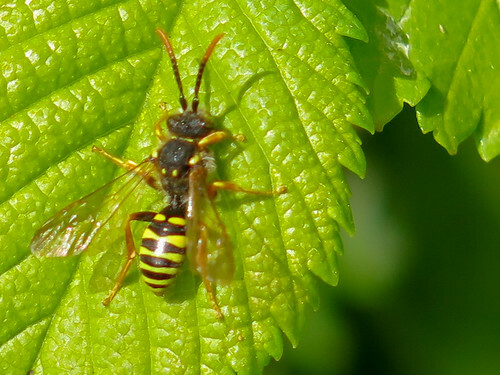 One further nomad bee briefly sighted – this appeared to be different to the previous individual photographed a few days earlier. Several of the Lassioglossum species also noted, predominantly foraging on the green alkanet with some visiting chickweed flowers also. A week off work meant that there was no visit to Bee Alley for a few days – a lunchtime visit on a sunny day to see who was about. 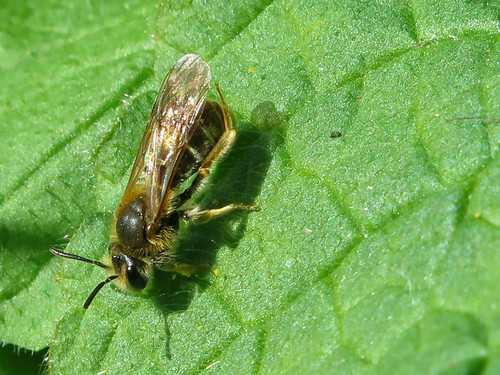 This female buffish mining bee – Andrena nigroaenea – was basking on the ivy leaves in between foraging on the borage flowers. There were many hoverflies about, including Myathropa florea and the cow parsley was just coming into flower. Walking back down, a distinctive bee caught my eye being pitch black and larger than the feather-footed flower females buzzing up and down. 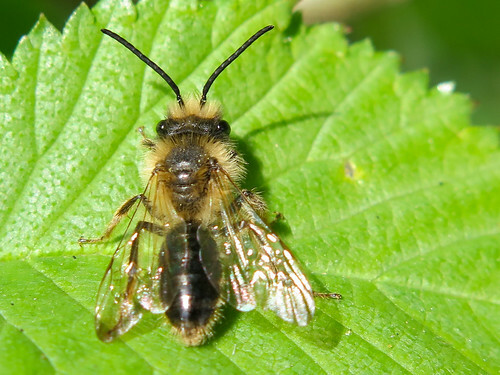 Not un-related, this was the common mourning bee – Melecta albifrons – which is a cuckoo of the Anthophora bees. 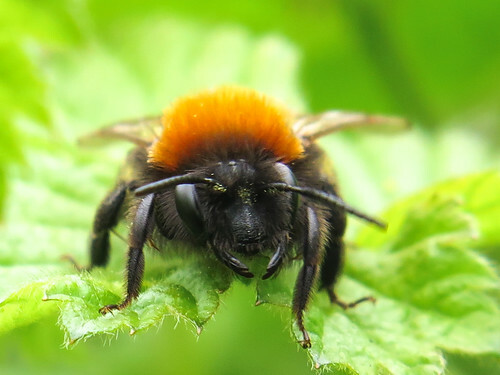 It was a cold, overcast day and only the hardy common carder bumblebees were foraging on the white deadnettle. The cow parsley is now flowering well with a few other species appearing including a rogue Spanish bluebell. I walked on up over the Hills and Hollows and found dewberry scrub sheltered beside a hawthorn hedge where several species were warming. A little out of bee alley but still nice to record! 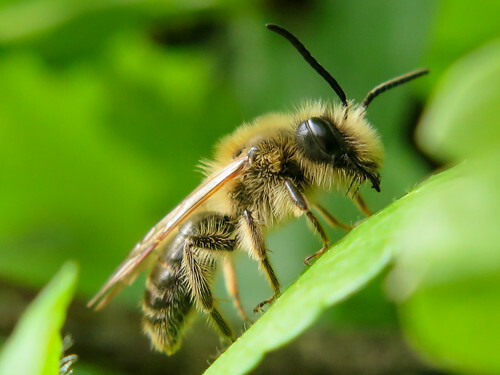 A male early mining bee – Andrena haemorrhoa. 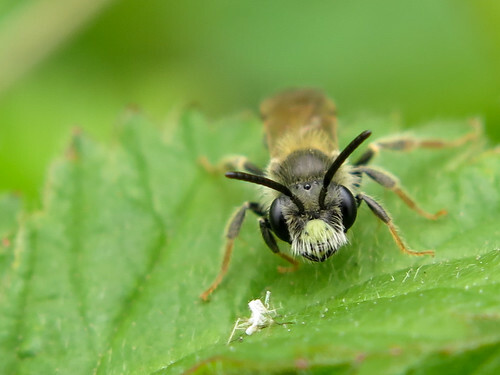 A male hawthorn mining bee – Andrena crysosceles. 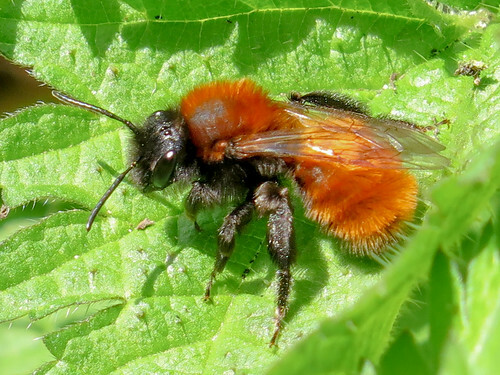 A female tawny mining bee – Andrena fulva. 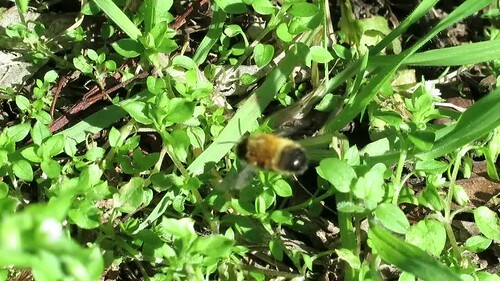 A cold day but with patches of sunshine to bring the bees out onto the wing. The common carders were still moving at the greatest speed between the white dead nettles and the green alkanet with a few other bumblebees also in evidence. 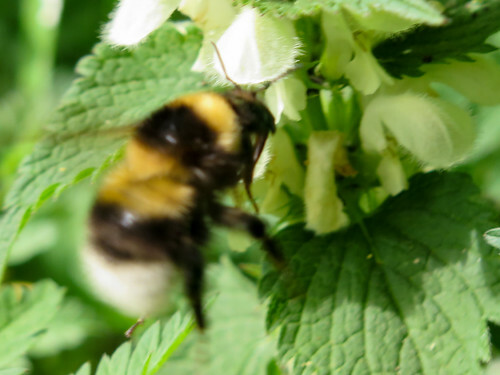 This rather embarrasing record shot is not the best of this bee, but the only one which shows the yellow band on both the thorax and abdomen identifying this bumble as a garden bumble bee – Bombus hortorum. For a while, there was no sign of honey bees – Abies mellifera along the alley but these have appeared in the last couple of visits and, like the carder bumbles, were happy to keep foraging in the cold weather in between sunny spells. Exclusively on the green alkanet so far. Temperatures have dropped significantly but there were patches of sunshine between the hail showers. I was photographing the two nomad species below just as the hail arrived and knocked it clean off the leaf! 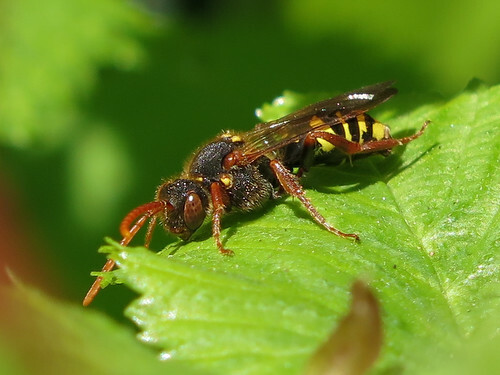 A female Marsham’s mining bee – Nomada marshamella resting on the newly emerged hazel leaves along the edge of the cemetery. 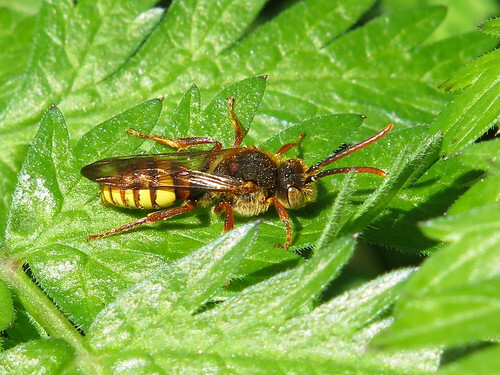 A male Gooden’s nomad bee – Nomada goodeniana – adjacent to the Marsham’s mining bee. After a week out and about in the field, it’s been a while. 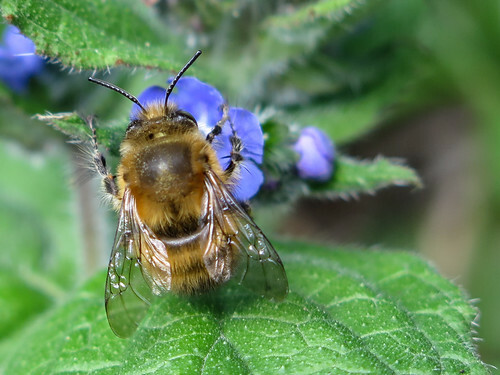 Unforunately, it was a cold, windy lunchtime and very little was apparent – only a solitary early bumblebee – Bombus praetorum – worker attending the green alkanet. 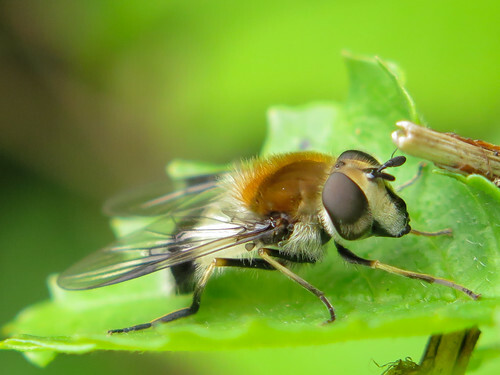 The only other species of note were several Leucozora leucorum hoverflies resting on ivy and hazel leaves – fairly docile and not inclined to flight when I went in for a photo!